Regular investing is the key to financial success. A small amount invested regularly can be more effective than larger amounts invested every now and then. The first step to regular investing is to set a financial goal. Your goal may be to retire at 45, buy your dream home or pay for your children’s education. When should you start your savings program? The longer your investment plan is in place, the more time compound interest is working for you. As Graph 1 shows, Joe’s savings grow more quickly over time, generating more returns each year, even though the rate of return and amount he saved was constant. The benefits of starting your program earlier can be best explained by comparing two investment plans. You may consider investing a portion of your money in growth assets such as shares and property. 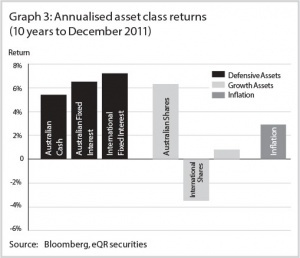 Growth assets can outperform inflation. However, they also carry a higher level of risk. Shares can be a very tax-effective investment if they pay dividends which are franked. Many listed companies pay tax on their profits before dividends are distributed to you. In other words, those dividends come to you ‘tax paid’. Your personal tax liability is calculated after taking into account the tax that the company has already paid. As a result, if you pay tax at the top marginal rate of 46.5% (including Medicare Levy) you’ll pay reduced tax on ‘fully franked’ dividends. If you’re paying tax at the lower rates, you’ll pay no tax on the dividend or may even qualify for a tax refund. Let’s have a look at an example which shows the benefits of having a regular savings and investment plan. Joe is 35 and wants to buy his dream yacht and sail around the world in 15 years time when his children have all finished school. Joe estimates that his dream yacht and the trip will cost $150,000 in today’s dollars and he already has $10,000 saved. If Joe invested $500 per month, he would have the $150,000 and a little extra as shown in Graph 1. This is assuming Joe’s investment earns a real return of 5% per annum after inflation and tax. 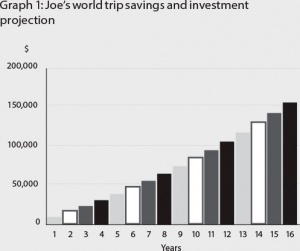 The increase in Joe’s accumulated savings is due to compound interest. Compounding is when interest is calculated on both the principal and the interest previously accrued. Carol and Jim are both aged 40. Carol decides to invest $1,000 per month for the next 20 years for her retirement. Jim decides to invest $2,000 a month, but he doesn’t start saving until he turns 50. They both intend to retire when they reach 60 and we assume that their investment will each generate 8% per annum with a marginal tax rate of 31.5%. 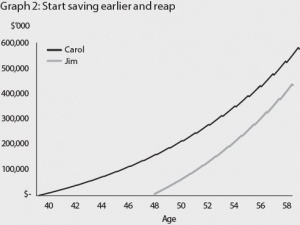 Graph 2 shows that even though Carol and Jim both invested $240,000 in total, Carol’s savings are more because of an extra 10 years of compound interest. If one of your goals is to retire in comfort, you should consider that the Superannuation Guarantee (SG) is currently only 9% of your salary. This seems like a lot but most people will need to save much more than 9% each year to meet their retirement goals. Successful investing requires you to stick with a regular investment plan. One of the ways to do this is to arrange a direct debit from your pay or bank account. Establish your financial goals, develop an investment plan and start saving regularly as soon as you can to make sure that compound interest works for you. Your financial adviser will work with you to understand your needs and can advise you on how to meet your goals. Your financial adviser can give you a copy of the relevant Product Disclosure Statement or disclosure document for any platform or financial product you are considering and you should read this document carefully before making any investment decision. OzPlan Financial Services, ACN AFSL 221235. This publication is current as at 1 July 2012, it provides an overview or summary only and it shouldn’t be considered a comprehensive statement on any matter or relied upon as such. The information in this publication does not take into account your objectives, financial situation or needs and so you should consider its appropriateness having regard to these factors before acting on it and obtaining financial advice. Any taxation position described in this publication is a general statement and should only be used as a guide. It does not constitute tax advice and is based on current tax laws and our interpretation. Your individual situation may differ and you should seek independent professional tax advice. The rules associated with the super and tax regimes are complex and subject to change and the opportunities and effects will differ depending on your personal circumstances. WL13700-0812cl.